The French government will replace the Paris police chief and ban rallies in some areas, after Saturday’s violent protests. Prime Minister Edouard Philippe said the authorities would act as soon as “radical groups” were identified in the worst-hit areas. Last Saturday, rioters smashed shops on Paris’s famed Champs-Élysées. About 10,000 people took part in the protest, a marked increase compared with similar recent rallies. 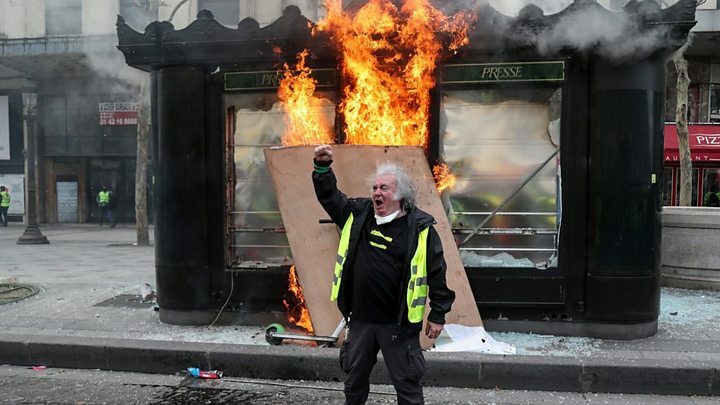 The “yellow vests” (“gilets jaunes”) began weekly protests across France four months ago, initially because of fuel tax rises. The movement escalated into a broader revolt against perceived elitism, for which activists blame President Emmanuel Macron. The famous Fouquet’s restaurant – a haunt of previous French presidents – was badly damaged in Saturday’s clashes. Rioters also vandalised a Boss menswear store and the luxury Longchamp handbag store. The Paris Ile-de-France Chamber of Commerce says that 91 businesses were hit, nearly all of them suffering serious damage. What did PM Philippe say? The restrictions would apply to Paris and other cities. Mr Philippe also admitted that “inappropriate instructions” had been given to Paris police to deal with protesters last Saturday. Mr Philippe said Paris police chief Michel Delpuech would be replaced on Wednesday by Didier Lallement, the top police official in the south-west Nouvelle-Aquitaine region. Organised groups of ultra-left radicals were largely responsible for last Saturday’s violence, but there has also been widespread criticism of the police response, the BBC’s Hugh Schofield in Paris reports. Far from intervening rapidly to stop the rioting, the police seemed to be on the defensive – one explanation being that they were reluctant to use their more powerful anti-riot ammunition because of concern over the injuries they can cause, our correspondent says. Meanwhile, President Macron cut short a skiing holiday and vowed “tough” action in response. “Now that’s the end. I demand that such scenes must not be repeated, especially on that [Champs-Élysées] avenue,” he said. Police used water cannon and tear gas to disperse the protesters. More than 120 people were arrested. Protesters threw cobblestones at police at the Arc de Triomphe war memorial. During the clashes, a policeman was filmed apparently stuffing Paris Saint-Germain football shirts into a bag. Police are probing that incident. The video, tweeted by journalist Rémy Buisine, appears to show police preventing him filming. He also asks the police why their ID numbers are not visible. The “gilets jaunes” mobilisation was bigger than similar demonstrations in recent weeks. Some 32,300 in total took to the streets throughout France, according to the interior ministry. Mr Macron offered concessions to the protesters late last year after the movement swept the nation – including €10bn (£8.5bn; $11bn) designed to boost the incomes of the poorest workers and pensioners. But discontent has rumbled on.